Fabulous racing is in prospect with the publication of the confirmations and entries for day one of the Qatar Goodwood Festival on Tuesday, July 28. The richest race on day one is the £300,000 Qatar Lennox Stakes (3.10pm), which has doubled in value this year courtesy of Qatar’s sponsorship. There are 18 confirmations for the seven-furlong contest including Godolphin’s Safety Check (Charlie Appleby), who won over the distance at Goodwood in 2014 and has since annexed two Group Two contests at Meydan, Dubai. Arod (Peter Chapple-Hyam) also goes forward following his victory in the Group Two Summer Mile at Ascot although his trainer has indicated he is more likely to run in Wednesday’s Group One Qatar Sussex Stakes, worth £1m. Goodwood’s leading trainer Richard Hannon may be represented by Toormore, also owned by Godolphin and winner of the Group Two Vintage Stakes over the same distance at Goodwood in 2013 and fourth last time out in the Group One Queen Anne Stakes at Royal Ascot. Toormore is also engaged in the Qatar Sussex Stakes. Tupi, a Listed scorer over seven furlongs in the Sir Henry Cecil Stakes at Newmarket’s July Meeting, could also line-up for the champion trainer. There is one Irish challenger going forward in Ansgar (Sabrina Harty), who won over the course and distance in the Group Three Supreme Stakes last season before going on to take the Group Two Park Stakes over the same distance at Doncaster. A strong three-year-old challenge could include Dutch Connection (Charlie Hills), winner of the Group Three Jersey Stakes at Royal Ascot and War Envoy (Aidan O’Brien IRE), successful in the mile Britannia Handicap at the same meeting. Limato (Henry Candy) finished runner-up in the inaugural running of the six-furlong Group One Commonwealth Cup and could step up to seven furlongs for the first time. The second race on Tuesday is the £200,000 Group Two Qatar Vintage Stakes (2.35pm), run over seven furlongs for two-year-olds. The contest, which has more than doubled in value this year (it was worth £80,000 in 2014), moves to a new position at the Qatar Goodwood Festival having previously been run on Wednesday. A total of 12 entries have been received for the Qatar Vintage Stakes, including a pair from Aidan O’Brien - Group Two Railway Stakes scorer Painted Cliffs and Air Vice Marshal, runner-up in the Group Two Superlative Stakes at Newmarket on July 11. Birchwood (Richard Fahey) was the winner of the Superlative Stakes in the famous blue silks of Godolphin, who could also be represented by Goodwood maiden winner Strong Challenge (Saeed bin Suroor). Mark Johnston has entered dual seven-furlong scorer Welford,while Richard Hannon’s two entries are Listed Chesham Stakes fourth Palawan and Humphrey Bogart. Sir Percy won the 2005 Vintage Stakes before famously going on to land the Derby at Epsom Downs the following season. 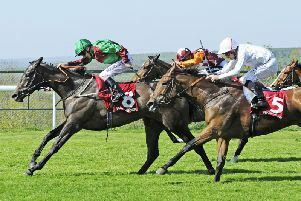 Twin Sails (Dean Ivory) is a son of Sir Percy and, after causing a 28/1 shock when successful on his debut at Newbury on June 11, the colt followed in his father’s footsteps by taking an auction stakes over six furlongs at Salisbury on June 24. Ivory, who is based at Radlett in Hertfordshire, reported: “Twins Sails is well and we are excited for next week at Goodwood. “Obviously, we are stepping him up quite a bit - maybe a little bit too high but we won’t know until we run him. The Qatar Vintage Stakes looks a stiff race. “He should handle Goodwood. The course is a little bit up and down but he has handled the gallops here at home very well and also won at Salisbury, so that should help him. The step up to seven furlongs should be fine for him. “As I say it is a tough race and he has to improve. If he gets in the frame, I would be delighted. The £100,000 Summer Handicap (3.45pm) is the big handicap on the first day of the Qatar Goodwood Festival. Staged over a mile and six furlongs for three-year-olds and upwards, the 34 entries for this contest include recent impressive York Listed scorer Astronereus (Amanda Perrett) and Notarised (Mark Johnston), who scooped the valuable Old Newton Cup at Haydock Park last time out. An intriguing entry is Sherlock Homes (Aidan O’Brien), successful on two of his three career starts. Action gets under way on Tuesday with the £50,000 Qatar Goodwood Festival Handicap (2.00pm, 33 entries) over just short of 10 furlongs and also features the £30,000 Weatherbys Private Banking Handicap (5f, 4.20pm, 22 entries), the £20,000 Kish Armstrong Memorial EBF Stallions Maiden (6f, 4.55pm, 30 entries) and the concluding £20,000 Turf Club Handicap (1m, 5.30pm, 39 entries). The going at Goodwood remains good (good to firm in places on the round course). There was three millimetres of rain on Monday. The forecast is for rain in the area on Friday and the need for any further watering will be reviewed after Friday.